eweCanknit pattern #117: SMALL CLOTHES Adult pattern for men & women. Uses worsted weight yarn. 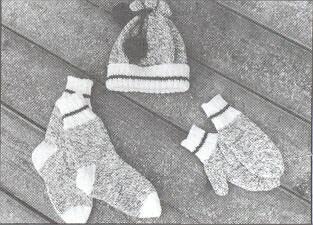 Pattern for hat, socks and mittens. Knit on DP and circulat needles. Gauge- 5 1/2 sts/inch.